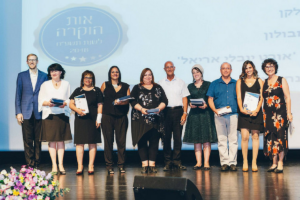 American Friends of Ariel (AFA), Mayor Eliyahu Shaviro, and the city of Ariel hosted the annual Honoring Excellent Educators Award Ceremony on June 5 at the Ariel Regional Center for Performing Arts. 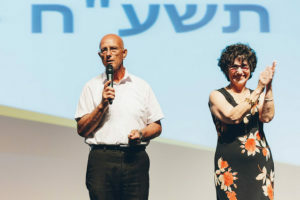 AFA Executive Director Avi Zimmerman and Ariel Department of Education Chairman Ilana Nulman were the masters of ceremonies, leading the event in both Hebrew and English. This year, we said a special “l’hitraot” (“See you later”) to Ilana, who has been promoted from her local position to head the Department of Education for the entire Samaria region. We also said a special goodbye to Dafna Pressman, Principal of the Bernard Milken Elementary School, who is retiring at the end of the academic year. We rounded off the night with a spectacular stand-up comedy performance from educator Nir Schwartzman, “the Teacher’s Comedian” whose act covers the ins and outs of education in Israel. Mazel Tov to all of our honorees, and best of luck to this year’s retiring educators! To learn more about our Education projects, click here.